I love writing these kinds of posts because it's so easy to get caught up in life and forget all the amazing things you've done throughout the month and that the sad looking bank account has all been worth it. Firstly I was kindly invited to the #LadbrokesLadiesDay at Doncaster. I met some lovely girls and had an amazing time sipping Prosecco all day, I wrote a full post here if you're interested! This month saw the return of the outfit posts! I absolutely love OOTD posts and by the feedback you guys give me you enjoy them too - I'm making a promise to myself to try my hardest to feature more outfits on this blog. Next I did a bit of Asos hauling and picked up 2 amazing pairs of shoes, the ever so comfy Superga's and these beautiful New Look boots which ended up being retweeted by New Look and gaining nearly 16,500 views on Twitter *stops for reality check*.. And finally one of my best friends turned 22 so we all took a day trip to York and drank our body weight in cocktails and had a little venture into MAC. That's all for this month but I have a tonne more amazing things coming up in October so keep your eyes peeled. 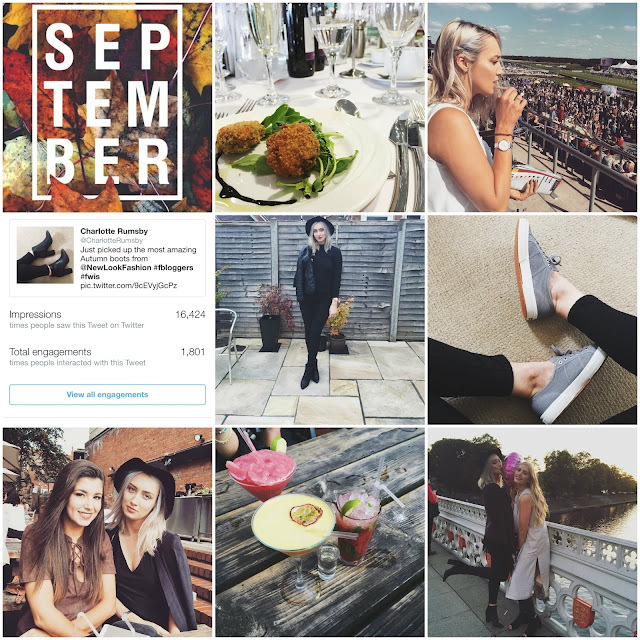 As always be sure to follow me on Bloglovin and Instagram to stay up to date with my posts.